As kid, I didn’t know Pappardelle pasta even existed. But a few years ago, I started to see it more often in the “upscale” restaurants I visited…and now I see pappardelle all the time. 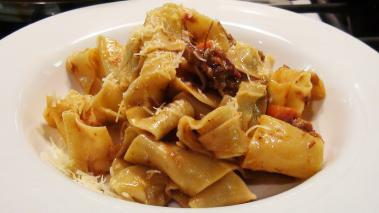 Usually, these broadly cut pasta noodles are served with a rich meat sauce…and usually they are very very tasty. Unfortunately, now that I have not only discovered, but also acquired a deep affection for pappardelle, I find it hard to buy in my local grocery stores. So what else is person to do, but to make their own. And in this recipe video, I combine my homemade pappardelle with a crazy good pork sugo, for a hearty, flavorful, pasta dish. If it’s already 5pm and you need to get dinner on the table, there are other sauces you can use for the pappardelle. I’ve got a great mushroom sugo, that has a deep, rich flavor, and which you can make in less than an hour. Heat your sauce in a sauté pan large enough to hold both the sauce and the cooked pasta. Cook it to al dente, which will only be a minute or so if the pasta is fresh. If you’re using dry pasta, follow the box directions, maybe erring on the side of a minute or so less - because over cooked pasta stinks. The other night I used up the last of my frozen pork sugo with this dish, and I’m going to be a bit sadder until I restock. Another nice thing about this dish, is that my friends and family don't see pappardelle at home all that often, so bringing this to the table gives a bit of "wow” factor...which is great for special occasion nights, or when you want to impress! Hope you enjoy it, and leave a comment to let me know how it goes.